The PhysioFit Berwick clinic was established in early 2016 by local Physiotherapist, Mark Eibl, after more than 20 years’ experience in private practice. Mark has lived in Upper Beaconsfield since 2003 and has been providing Physiotherapy services to the local Berwick and surrounding community from for the past 14 years from consulting rooms in Berwick, also from Hampton Park Physiotherapy, dealing predominantly with sports and spinal injuries and chronic musculoskeletal conditions. 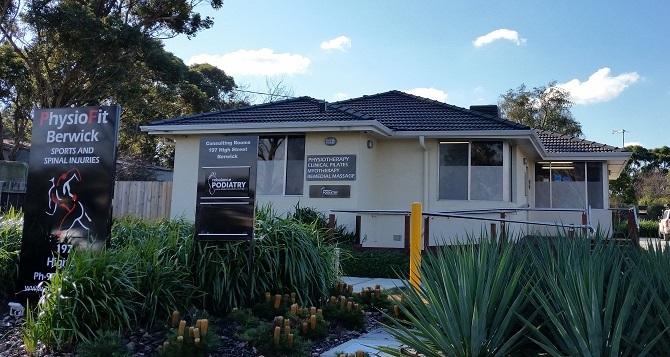 Our newly renovated clinic at 197 High Street, Berwick is situated close to Akoonah Park and opposite Haileybury, on the service road between Manuka Road and Cardinia Street. We are in a convenient and easily accessible location for most of the Berwick, Beaconsfield and the surrounding Casey and Cardinia community, and we provide ample parking on the premises. Want to know more about us? Drop in for a chat with our friendly reception staff and feel free to make an appointment if you would like to see Mark or any of our other allied health services team. With our experience and expertise, PhysioFit Berwick provides safe, evidence-based, hands-on, physiotherapy to improve overall health and well-being. When you are treated at PhysioFit Berwick you will experience hands on therapy from manual therapists as well as exercise prescription, not just talking.